When you first join Pinterest, pinning seems simple. You upload an image and a link to a board you have, and voila — you’ve got a pin. The fervor sets in and you begin to pin all the things you can find: photographs, infographics, logos, icons. As long as it’s an image, it gets pinned. Sadly, you can’t pin a million things and expect people to click through to your content every time. You’ve got to make each pin count. Optimizing pins instead of posting willy-nilly isn’t hard. It just calls for more thought into your brand: What exactly are you pinning? What does it say about your business? Why should your audience (and ultimately, your customers) care? Keep reading to learn how to create your own pin, as well as the most important parts of a pin your audience will want to pin themselves. Click the plus sign (+) at the top of your Pinterest profile. Select “Create Pin” from the dropdown menu. Upload an image file from your computer and add a destination link. Enter a destination link from which to save an image from that website. Choose a board to add your pin to. Select “Save” to create your Pinterest pin. 1. Click the plus sign (+) at the top of your Pinterest profile. To create your first pin, navigate to your profile by clicking your name and/or profile picture on the top-righthand corner of Pinterest. 2. Select “Create Pin” from the dropdown menu. On your profile page, above the interest boards you selected when creating your Pinterest profile, click the plus sign icon (“+”) and select “Create Pin” from the dropdown menu that appears, as shown below. 3. Upload an image file from your computer and add a destination link. If you’re using a desktop computer, clicking “Create Pin” from your Pinterest profile page will bring you to the pin-creation form shown below. To upload an image file from a folder on your computer, simply click the gray box and select the image file from the window that appears on your screen. You can also drag the image file itself directly into this gray box. Once your image is uploaded, click “Add a destination link” on the bottom-righthand corner of the form and enter the website you want this pin to link to when users click on it. 4. Enter a destination link from which to save an image from that website. If the image you want to pin already lives online somewhere, click “Save from site” beneath the gray image-upload box, and enter the URL of the website. This will be the website your image automatically links to when your pin goes live. 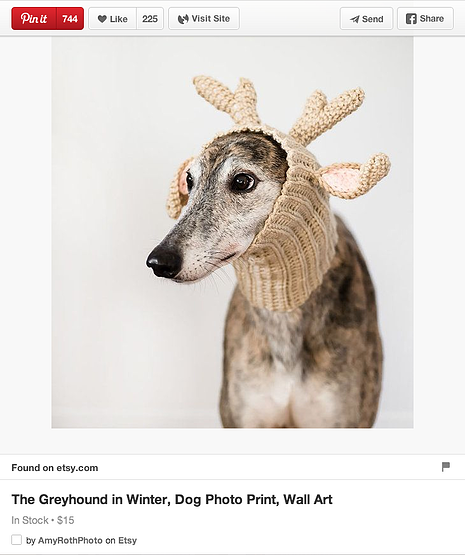 In the window that appears, you might see more than one image to choose from — these are all the images Pinterest found living on the webpage you’re linking to. Scroll until you find the image you want to pin, and select it. With your image successfully uploaded, it’s time to optimize your pin with appropriate text. Click the “Add your title” preview text and give your pin an enticing preview that best represents the content of your pin — and the website to which the image links. 6. Add a pin description. Add a description for your pin beneath your title, up to 500 characters. Keep in mind only the first 50 characters of your pin description will appear beneath the image in user’s Pinterest newsfeeds. We’ll talk about how to optimize your pin description in the next section of this blog post. 7. Choose a Pinterest board to add your pin to. Your final task before saving your pin is to add this pin to a “board.” As a Pinterest user, you can create boards that sort your pinned content based on your various interests. To select or create a board for this pin, click “Choose a board (required)” beneath your pin’s destination link. 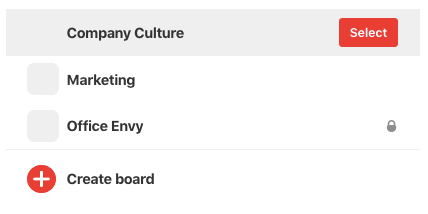 You’ll be taken to the page shown above, where you can choose or create a board that best represents the type of content you’re currently pinning. 8. Click “Save” to create your Pinterest pin. Once you’ve selected a board to add your pin to, return to the pin-creation form and hit the red “Save” button at the top of your screen. Follow the prompts to push your pin live, and you’ll be all set. There are lots of ways to make your pins look more beautiful, but if you’re just getting started, sticking to a large, high-resolution image will work. You don’t have to create every image you pin (though if you want to, here are some free tools to help you), but you should stay away from pinning cheesy stock photos — Pinterest users love inspirational, beautiful photos or graphics, or images that are extremely helpful, clever, or informational. Although you might provide a link to the content you’re promoting in the pin’s description (which we’ll talk about in step 5, below), it’s just as important to include this link in the image you’re pinning. If the image you’re pinning already lives somewhere online, this is easy to do — you’ll simply add the website link first, then select the image you want to pin once this link has been entered. What Pinterest won’t prompt you to do, but you should do anyway, is add a UTM code to the end of this link. UTM codes, also known as tracking tags, allow you to identify where your website traffic came from if it didn’t come organically from a search engine. In this case, you can add a UTM code indicating when your website traffic came from a Pinterest pin. It’s pretty simple: If you’re pinning someone else’s content, give them credit in the description or the link you’re connecting to your pin. If you’re pinning your original content, add your logo or website URL in the photo — if folks share your content without attributing it to you, people will still know where it came from. 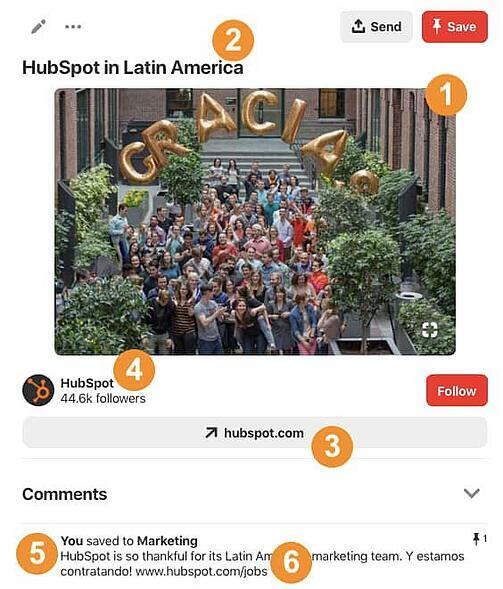 In the example above, this is a design HubSpot made, so we threw up our logo in the background — it’s not intrusive, but it helps identify the image as ours. A pin’s description is one of the most overlooked parts of a pin — scroll through Pinterest and you’ll see lots of pins without any at all. Even though others are doing it, you shouldn’t. If you’re trying to use Pinterest to build your business, you can’t forget the description — it could have too big of an impact on your results. Keep your copy concise, yet enticing. Tell readers what they’ll get if they click on the pin. 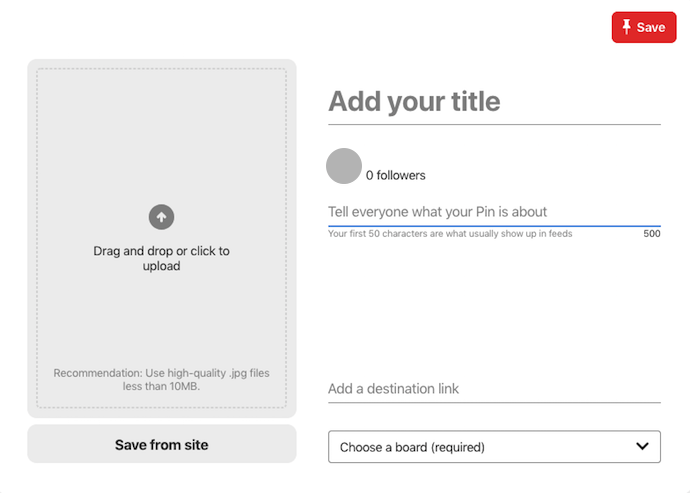 Pinterest allots up to 500 characters of space for a pin description, reserving the first 50 characters for what will appear on most user’s Pinterest newsfeeds. All things considered, pins with descriptions around 100 characters are often ideal to maintain brevity while enticing users to click your pin. Also make sure you’re using SEO-friendly terms to describe the content behind the pin so your pins can successfully rank in search engines. Notice in the example above we also include the phrase “we’re hiring” in Spanish to optimize the pin for keywords used by Spanish-speaking professionals — the target audience for this particular pin. Even on Pinterest, where it’s a standard practice to click on links, people need a little overt reminder to click. Even though you have a link in the pin itself, add a little call-to-action in the description to the pin’s link — it could pay off big-time for you. I know what you’re thinking: Why is this one a star instead of a number? Did Ginny make one huge typo in the middle of her blog post? The reason I included this as a star is because not all businesses can realistically use Rich Pins … but if your business can, you absolutely should. Rich Pins can perform much better than their not-so-rich counterparts. In fact, according to Shopify, 39% of “pinners” on Pinterest are more likely to be active shoppers than non-pinners, and 93% of Pinterest users are on the platform to explore potential purchases. If you’re looking to optimize your Pinterest presence to the fullest and have content that could fall in a Rich Pin category, figure out how to get them enabled for your website’s content. This is kind of a trick element because it’s not technically in the pin itself, but because of the way the pin layout looks when expanded, I had to include it here. Try clicking on a pin in Pinterest — when you expand the pin, all the other pin images from the user’s board are pulled in. This gives you more opportunities to engage with your Pinterest followers all without doing a thing.